As President his major initiatives included the consolidation of numerous governmental agencies into the newly formed Department of Energy, a cabinet level department. He enacted strong environmental legislation; deregulated the trucking, airline, rail, finance, communications, and oil industries; bolstered the social security system; and appointed record numbers of women and minorities to significant government and judicial posts. In foreign affairs, Carter's major initiatives included the Camp David Accords, the Panama Canal Treaties, the creation of full diplomatic relations with the People's Republic of China, and the negotiation of the SALT II Treaty. In addition, he's a champion of human rights throughout the world and used human rights as the centre of his administration's foreign policy. 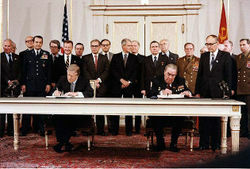 The Soviet invasion of Afghanistan marked the end of détente, and Carter moved to the right, boycotted the 1980 Summer Olympics in Moscow, and began to rebuild American military power. He beat off a primary challenge from Senator Ted Kennedy but was unable to effectively reduce soaring interest rates and inflation rates, or to lower unemployment. The " Misery Index", his favored measure of economic well-being, rose 50% in four years. He feuded with the Democratic leaders who controlled Congress and, as a result, was unable to reform the tax system or to implement a national health plan. 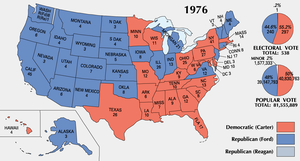 He was defeated by Republican Ronald Reagan in 1980. 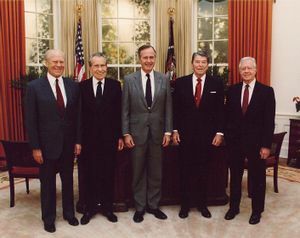 After leaving office, Carter assumed the role of an elder statesman and international mediator, using his prestige as a former president to further many causes. He founded the Carter Centre as a forum for issues related to democracy and human rights. He has also traveled extensively to monitor elections, conduct peace negotiations, and establish relief efforts. In 2002, Carter won the Nobel Peace Prize for his "efforts to find peaceful solutions to international conflicts, to advance democracy and human rights, and to promote economic and social development." Carter has continued his decades-long active involvement with the charity Habitat for Humanity, which builds houses for the needy. He attended Georgia Southwestern College and Georgia Institute of Technology and received a Bachelor of Science degree from the United States Naval Academy in 1946. Carter was a gifted student and finished 59th out of his Academy class of 820. Carter served on submarines in the Atlantic and Pacific fleets. He was later selected by Captain (later Admiral) Hyman G. Rickover for the U.S. Navy's fledgling nuclear submarine program, where he became a qualified command officer. Rickover was a demanding officer, and Carter was greatly influenced by him. Carter later said that next to his parents, Admiral Rickover had had the greatest influence on him. There was a story he often told of being interviewed by the Admiral. He was asked about his rank in his class at the Naval Academy. Carter said "Sir, I graduated 59th out of a class of 820". Rickover only asked "Did you always do your best?" Carter was forced to admit he had not, and the Admiral asked why. Carter later used this as the theme of his presidential campaign, and as the title of his first book, "Why Not The Best?" Carter loved the Navy, and had planned to make it his career. His ultimate goal was to become Chief of Naval Operations. Carter did some post-graduate work, studying nuclear physics and reactor technology for several months at Union College starting in March 1953. He married Rosalynn Smith in 1946. They had three sons, ( John William "Jack" Carter, born in 1947; James Earl "Chip" Carter III, born in 1950; and Donnel Jeffrey "Jeff" Carter, born in 1952), and a daughter ( Amy Lynn Carter, in 1967). Upon the death of his father in July 1953, however, LT. Carter immediately resigned his commission and was discharged from the Navy on October 9, 1953. This cut short his nuclear power training school and unfortunately he was never able to command a nuclear submarine, as the first of the fleet was launched January 17, 1955, over a year after his discharge from the Navy. The price inflation caused interest rates to rise to unprecedented levels (above 12% per year). The prime rate hit 21.5 in December 1980, highest in history . Investments in fixed income (both bonds, and pensions being paid to retired people) were becoming less valuable. With the markets for U.S. government debt coming under pressure, Carter appointed Paul Volcker as Chairman of the Federal Reserve Board; Volcker replaced G. William Miller who left to become the Secretary of the Treasury. Volcker pursued a tight monetary policy to bring down inflation, which he considered his mandate. He succeeded, but only by first going through a very unpleasant phase where the economy slowed down, causing a rise in unemployment, prior to any relief from the inflation. The stagnant growth of the economy (causing unemployment), in combination with a high rate of inflation, has often been called stagflation, an unprecedented situation in American economics that Volcker is credited for ending. One of the most controversial moves of President Carter's presidency was the final negotiation and signature of the Panama Canal Treaties in September 1977. Those treaties, which essentially would transfer control of the American-built Panama Canal to the nation of Panama, were bitterly opposed by a segment of the American public and by the Republican Party. A common argument against the treaties was that the United States was transferring an American asset of great strategic value to an unstable and corrupt country led by a brutal military dictator ( Omar Torrijos). After the signature of the Canal treaties, in June 1978, Jimmy Carter visited Panama with his wife and twelve U. S. Senators, amid widespread student disturbances against the Torrijos dictatorship. Carter then began urging the Torrijos regime to soften its policies and move Panama towards gradual democratization. This treaty ultimately helped relations with Panama and Latin America. Despite having previously denied the Shah entry into the United States for medical treatment, on October 22, 1979, Carter finally granted him entry and temporary asylum for the duration of his cancer treatment; the Shah left for Panama on December 15, 1979. In response to the Shah's entry into the U.S., Iranian militants seized the American embassy in Tehran, taking 52 Americans hostage. The Iranians demanded (1) the return of the Shah to Iran for trial, (2) the return of the Shah's wealth to the Iranian people, (3) an admission of guilt by the United States for its past actions in Iran, plus an apology, and (4) a promise from the United States not to interfere in Iran's affairs in the future. Though later that year the Shah left the U.S. and died in Egypt, the hostage crisis continued and dominated the last year of Carter's presidency, even though almost half of the hostages were released. 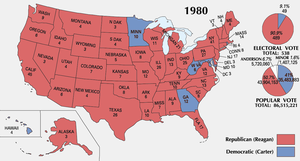 The subsequent responses to the crisis—from a " Rose Garden strategy" of staying inside the White House, to the unsuccessful attempt to rescue the hostages—were largely seen as contributing to defeat in the 1980 election. Jimmy Carter and Walter Mondale are the longest-living post-presidential team in American history. On May 23, 2006, they had been out of office for 25 years and 123 days, surpassing the record established by President John Adams and Vice President Thomas Jefferson. Adams and Jefferson died on the same day— July 4, 1826. In June 2005, Carter urged the closing of the Guantanamo Bay Prison in Cuba, which has been the centre point for recent claims of prisoner abuse. Not all Carter's efforts have gained him favour in Washington; President Clinton and both Presidents George H.W. and George W. Bush were said to have been less than pleased with Carter's "freelance" diplomacy in Iraq and elsewhere. 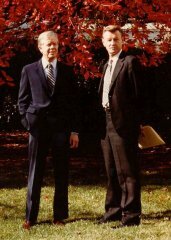 Carter has been involved in a variety of national and international public policy, conflict resolution, human rights and charitable causes through the Carter Center. 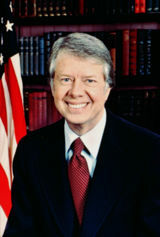 He established the Carter Center the year following his term and currently chairs the center with his wife Rosalynn. The centre also focuses on world-wide health care including the campaign to eliminate guinea worm disease. He and members of the centre are sometimes involved in the monitoring of the electoral process in support of free and fair elections. This includes acting as election observers, particularly in Latin America and Africa. In August 2006, Carter made remarks controversial with many Jewish Americans and Democratic supporters of Israel when he said on the 15th of that month "I don't think Israel has any legal or moral justification for their massive bombing of the entire nation of Lebanon," and on the same topic, "I represent the vast majority of Democrats." His remarks were in response to the Israel-Hezbollah war of that summer. On November 22, 2004, New York Republican Governor George Pataki named Carter and the other living former Presidents (Gerald Ford, George H. W. Bush, and Bill Clinton) as honorary members of the board rebuilding the World Trade Centre. President George W. Bush (second from left), walks with, from left, former President George H.W. Bush, former President Bill Clinton and former President Jimmy Carter during the dedication of the William J. Clinton Presidential Centre and Park in Little Rock, Arkansas, November 18, 2004.